Flores consists of numerous islands. Gili Laba is one of them. People also call it Land Gili Lawa. The beauty is unparalleled so tourists can spend a great holiday here. You can reach it using a speedboat from Labuan Bajo. It is located near to numerous beautiful spots like Sebayur Island and many others. For those who like trekking, Gili Laba is a good destination. Usually, people come here either in the morning or afternoon. These are the perfect times for hiking. In terms of appearance, Gili Laba is both stunning and calm. The sky is clear in the summer. It features many beautiful landscapes like green hills, blue water, shallow beaches, bushes, and soothing wind. In the hills, you can find wild grasses. The atmosphere is quite similar to a savanna. This tourist spot is suitable for trekking and relaxing. Everyone would obtain great experiences here. Apart from trekking, you can also enjoy the water. It is clear and shallow. Make sure you don’t get too far, though. This place is quite similar to Padar Island. It is due to its hills, actually. From the top of these hills, you can witness great scenery. Though, it takes much energy to get here. Make sure you have prepared enough stamina. In a nutshell, hiking is the most popular activity in Gili Laba. It is the main activity here. In order to reach the summit of the hill, you need to spend approximately 40 minutes. It can be either faster or slower. It depends on your stamina. Today, many tourist agencies include Gili Laba into their vacation package. 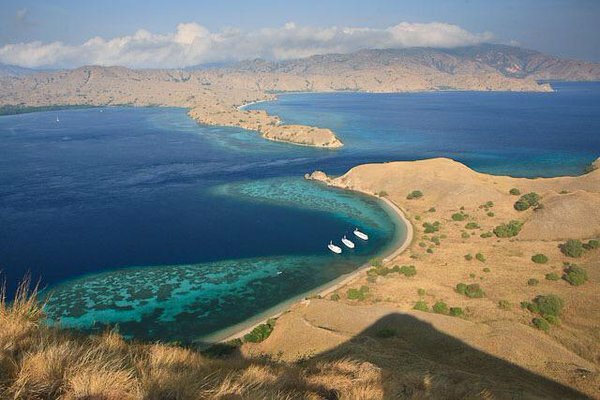 Before reaching Komodo National Park, your boats will visit some small islands. One of them is Gili Laba. You should be astonished by its hills. Moreover, it offers other attractions like beaches. The sand is soft and white. It is possible to perform some water sports like snorkeling and swimming. You can even relax near to the shorelines and enjoy sunbathing. No worries. There are no Komodo dragons nearby. The most common animals in Gili Laba are small bugs and birds. That means you won’t encounter dangerous creatures here. When it comes to trekking, you should have prepared everything. These include stamina, bottled water, snacks, and a camera. You also need some trekking equipment. Once you reach the top, you can take some pictures or inhale the fresh air. The scenery is jaw-dropping. It definitely gives you a unique impression. Are you interested. Gili Laba is a small island. It is the part of Sumbawa Island. You can reach it from Labuan Bajo, though. It takes 4 hours to Gili Laba using a speedboat. Actually, it is possible to visit the island from Komodo Island. From here, it takes an hour. The trip is comfortable and fun. That is for sure.